Remember when everyone was down on avocados because OMG! FAT!? And people did unspeakable things like make guacamole with frozen peas? Aren’t we glad those days are over and we live in a time when fat is no longer demonized and we can enjoy guacamole without peas like God intended? YES! While avocados are a great source of a variety of vitamins and potassium, their fat content is where they really shine. There are healthy fats and unhealthy fats, and avocado is chock full of the healthy monounsaturated kind, which is good for the heart and reduces inflammation. 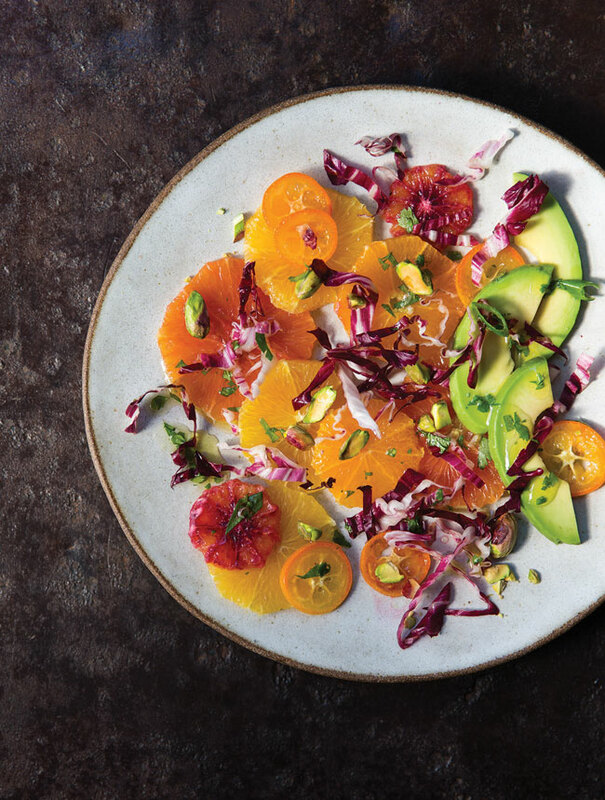 This Citrus and Avocado salad, from Deborah Madison’s new cookbook In My Kitchen is one of those deceptively simple recipes that doesn’t sound like much when you look at the list of ingredients, but those ingredients come together and create something completely divine. And now is the best time of the year to make this, with grocery stores full of both common and uncommon citrus fruits. We had this alongside tofu tacos, but as I was eating, it occurred to me that, if you finely chopped this salad, it would make a fantastic topping for tacos too. 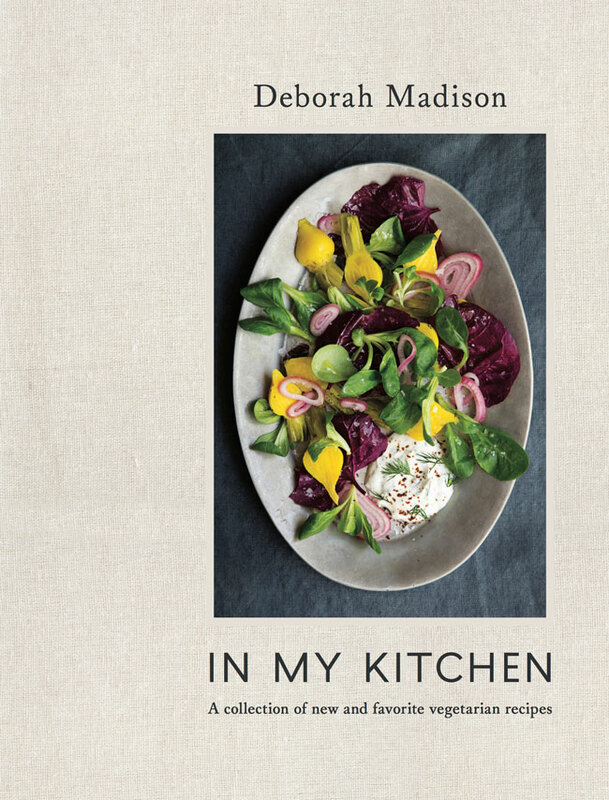 One of the first cookbooks I owned was by Deborah Madison and as someone who hasn’t eaten meat since I was a preteen, I’m kind of a fangirl—no one does vegetables like she does. When you’ve been a vegetarian for a while, it’s easy to fall into a rut—and so many vegetarian cookbooks offer slight variations on the same few recipes. (How many black bean burger recipes do I really need?!) If you’re looking for new ways to prepare veggie-centric meals, whether you’re vegetarian or not, you’ll appreciate this cookbook for its innovative recipe ideas. Reprinted with permission from In My Kitchen by Deborah Madison, copyright © 2017. Photography by Erin Scott. Published by Ten Speed Press, an imprint of Penguin Random House LLC. Take a slice off the stem end and flower end of each orange so that the fruit stands on a cutting board without wobbling. Using a sharp knife, slice down the sides, cutting just beneath the white pith. (Sometimes it takes a few strokes to get under it.) When you’ve removed most of the pith, hold the orange in your hand and slice off any patches that remain, then slice the fruit into rounds about 1⁄4 inch thick. Do this with all the oranges and put the slices in a shallow bowl. (If you wish to include thin slices of kumquats with their skins, do so.) Cover and refrigerate until you’re ready to serve. Begin by pounding the garlic in a mortar with 1⁄2 teaspoon of salt until it’s smooth, after half a minute or so. Add the lime zest, juice, scallions, and chile if using. Set aside. Toast the cumin and coriander seeds in a dry skillet until aromatic, then turn them out on a plate to cool briefly. Grind them to a powder in a spice grinder. Add them, along with the rest of the spices, to the mortar and then whisk in the oil and add the cilantro. Taste a little dressing on a piece of orange to make sure the balance is right. Halve the avocado, scoop out the flesh, cut it lengthwise into slices, and lay them on the oranges. Pour the dressing over all, then scatter the shredded greens and the pistachios over the top. Present the salad like this, but toss it a bit as you serve it so that everything is well mixed.